Spring is time to think ahead . . .
Spring is the season of growth, renewal, and repair. 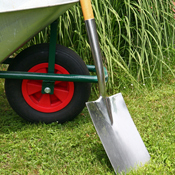 Advantage services help your turf and landscape recover from winter and look beautiful. Spring is also a great time to explore adding a new feature to your property. Schedule a lawn and/or landscaping consultation today. Add and refresh bark, mulch, stone and gravel to enhance appearance and improve the growing environment. Seed or sod areas damaged from the winter. Highlight your landscaping with a lighting system to enhance the beauty and add safety and security to your property. Visit our Seasonal News page for information about the importance of cleaning and sealing your patio and a word about landscape mulch . . .
Spring is a great time to explore adding a new feature to your property.